Ch. Strawberry's Hallmark was born in March 2002. Liz is one of those Boxers in which everything is overflowing -- love, joy, spirit, energy. Liz took her first points in Sept of 2002 on the Montana circuit. 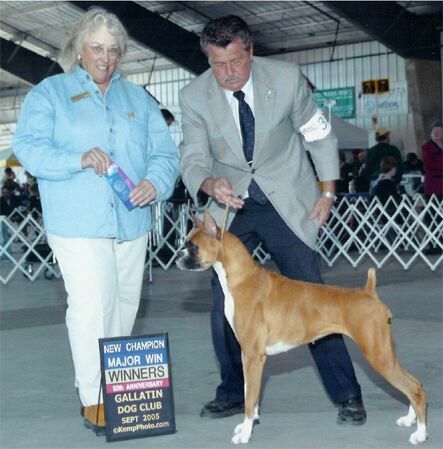 She took a 5 point major under Marion D. Ward-Fanning in Montana in Sept 2005 to finish her championship. Liz is the 12th American champion for her sire Am/Can Ch. Strawberry's Caballero and her dam, Ch. Strawberry's Legacy DOM is a third generation DOM.